Australia’s first commercial office tower to be made of timber is coming to the Barangaroo development in Sydney. 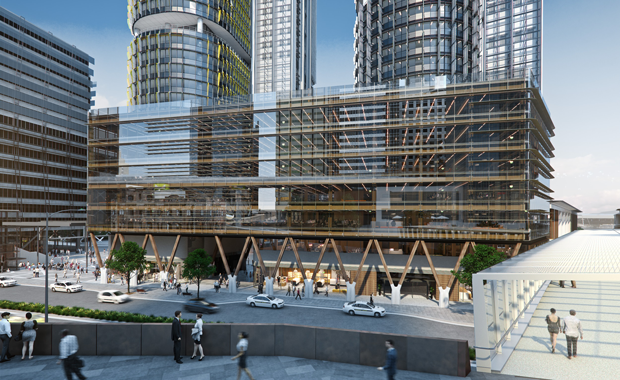 International House Sydney will be located at the gateway to Barangaroo on Sussex Street and will be built by Lendlease. The six-storey building will be made of Cross Laminated Timber (CLT) and Glulam (glue laminated timber). The building will be constructed by Lendlease’s Designmake business which invests in smart design and advanced manufacturing processes to make pre-fabricated building components for customers. Components are designed and made in a modern facility in Western Sydney. The timber is sourced from Austria from sustainably managed forests. CLT is made of layers of softwood timber arranged crossways and glued under pressure into large timber panels. Lendlease's Barangaroo South managing director Andrew Wilson told The Australian Financial Review that they were on the way to creating Australia's first large-scale carbon neutral community. "The source of materials is important. To use at scale, timber is the only renewable resource," he said. Advantages of the timber materials including a reduction in carbon footprint, zero waste materials, and is generally safer and quicker to build.